Take advantage of the harvest season to teach seasonal words and rhyming words. 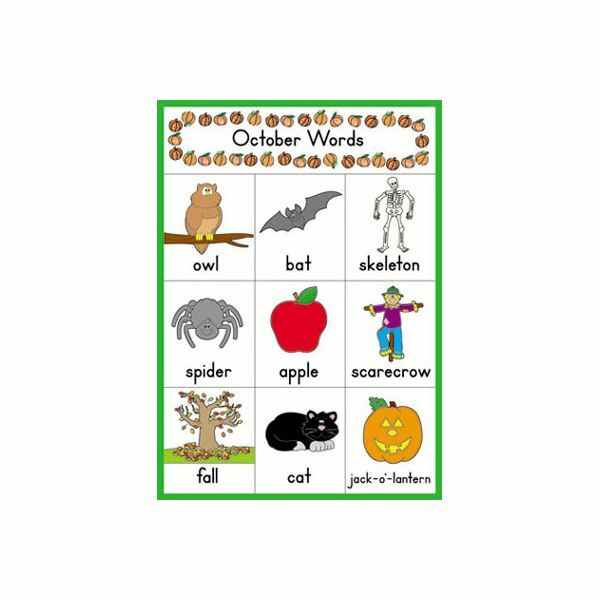 The posters used for the rhyming words activity are available through teacher's stores. Carson Dellosa is the publisher. Have a place in the classroom to post these monthly word charts for the students. They are ideal for ages 4-8. Be sure to read them together at the beginning of the month. Students will use the chart to spell words during independent writing time and play. More information about the posters is available in the reference section. The activity can be completed without the poster, but it makes for an ideal visual. As stated above, read the poster ahead of the lesson. Make the books – you should have at least five pages per book. Have the dry erase boards, markers and erasers easily accessible. I think it is best to put students into a large circle on the rug. If you have a teaching assistant, he or she can monitor and help. 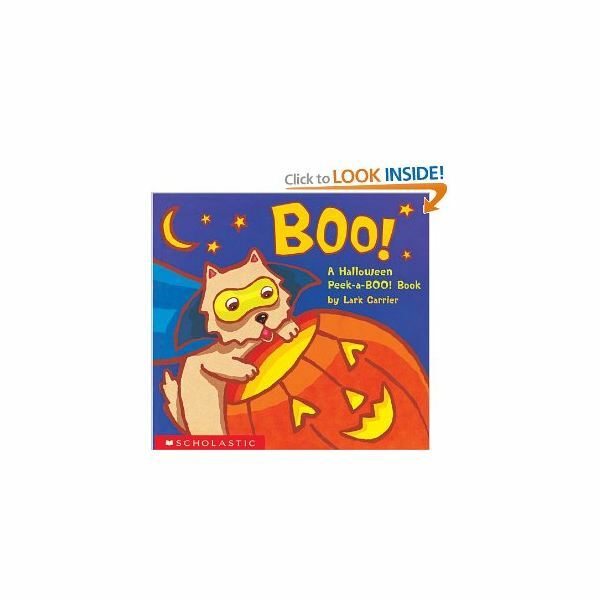 Gather your Halloween book bin or baggie; a good Halloween rhyming book is "Boo!" by, Lark Carrier (Scholastic). Discuss some of the rhyming big books, poems, songs, or nursery rhymes that you have read thus far this school year. Show students Halloween pictures or books. Discuss the season and the Halloween holiday. Show the students the list of October words. Point to each picture and say the words together. Then, spell the words. Tell them that as a class you will create some rhyming words books. Choose two words that already rhyme from the poster, cat and bat. Write them on the teacher's dry erase board or whiteboard if you have one. Begin to notice the way they sound. Next, have the student's notice the way the words look. Notice that -at is the ending of both words (underline it). Let the students copy the two words (in list form) onto the dry erase boards. Ask the students if they can think of another word that rhymes with cat and bat. Record these on chart paper and let the students record them onto dry erase boards. Continue until you have a list of rhyming words. It is a good lesson to introduce word families in the beginning of the school year. Show the students the little books and have a model prepared ahead of time for them to see. Write a title on the cover, I Can Rhyme, and the author and illustrator's name (student name). On each page, students pick a rhyming word to write (one word only per page) and illustrate. It is a good idea for younger students to add one small black line on the bottom of the page for each word to assist these beginner writers. This will teach students one to one correspondence of picture to word. Have the students touch each page as they reread. Can the students recreate the list, understand the concept of rhyming and do they exhibit an understanding of one to one correspondence? Leave your list on the dry erase board and allow students to make the words with magnetic boards and letters during center time. Because students have already interacted with the words, they will love the time to practice more. Remember when teaching younger students, it is important to give praise for their every effort. Some students will have the ability to write (copy) the words and others may not. Some pictures will look like the object and others may not. This is OK! Keep them focused on drawing just the object or they will draw a whole scene (which is great for other writing purposes, but not these books). Also make note of the beginning sound of the word as you are making your way around the word. For example, say, "Oh cat! Cat starts with "c" and hard "c" makes the /k/, /k/, /k/ sound!" Make silly sentences with the new words. For example, "The fat cat chased the bat, but grew tired and sat on a mat." Keep the books on hand to allow them to reread their work and to show them their progress later in the school year. The best thing about doing this Kindergarten Halloween activity is that your students will be interacting with words as they spell, write and illustrate. Enjoy! Content by author experience teaching Kindergarten.